SILS is a rapidly developed as both cosmetic advantage of NOTES and standard surgical procedure. We report the new technique of umbilical SILS in the treatment of gastric and esophagus disease with conventional laparoscopic instruments. Preliminary experience with umbilical SILS operation was performed in 2 patients with esophageal achalasia; 1 patient with hiatus hernia and reflux esophagitis; 3 patients with Gastric stromal tumors; 3 patients with stomach cancer. In all patients, a supine posture with legs apart was adopted. A superficial incision 3cm long was made vertically within the umbilical, with three trocars forming an inverted equilateral triangle. The gastrocolic and gastrosplenic ligaments were divided and the fundus of the stomach was freed from the surrounding attachments along the greater curvature to the left crus of the diaphragm. The serosa on the anterior gastroesophageal junction wall was dissected, followed by division of the hepatogastric ligament along the lesser curvature superior to the left gastric vessels, continuing to the gastroesophageal junction, similarly exposing the right crus of the diaphragm. The patient with late stage gastric cancer died while still in hospital as a result of pulmonary embolism, while all the other patients recovered uneventfully without anastomotic leakage or bleeding and no anastomotic stenosis. The earliest discharge was on the 4 while the latest on the 10 postoperative day. 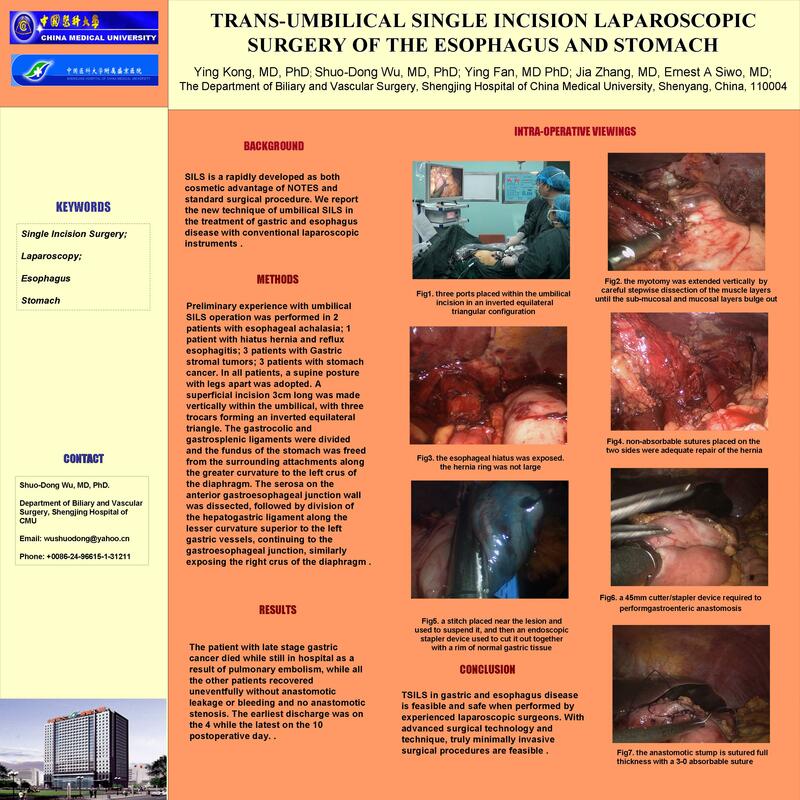 TSILS in gastric and esophagus disease is feasible and safe when performed by experienced laparoscopic surgeons. With advanced surgical technology and technique, truly minimally invasive surgical procedures are feasible.